But I thought Santa was just a pub crawl? 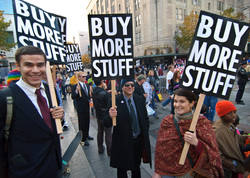 While the "Buy More Stuff" guys aren't Santa, they certainly are aligned with the message Santa is trying to get across. That being the ridiculousness of the holidays. These guys do it with less alcohol but just as much zest... so lets stop a moment to give them some props.